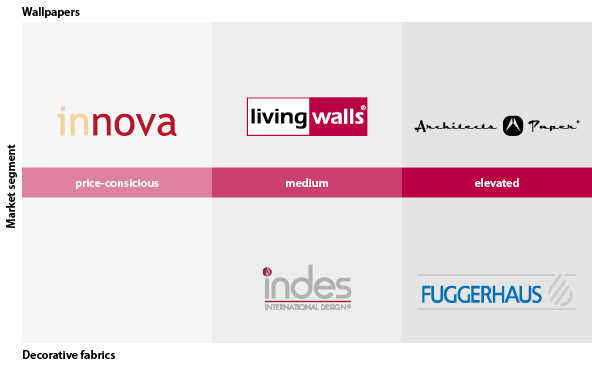 In the wallpaper segment, A.S. Création distinguishes between the brands of "innova", "A.S. Création", "livingwalls" and "Architects Paper". The entry-level brand "innova" represents the basic assortment of products for price-conscious buyers here. The "A.S. Création" brand stands for a higher quality and broader product range when compared to "innova". "livingwalls" is more modern than "A.S. Création" and includes, for example, designer and lifestyle wallpaper collections. We therefore market the wallpapers of Lars Contzen and ESPRIT home under "livingwalls". Lastly, "Architects Paper" is the brand of the higher quality and speciality product range of A.S. Création. This brand stands for exclusive, individual and custom wall solutions as well as hand-made wallpaper for architects, designers, interior designers and discerning private customers. The brands of "Indes" and "Fuggerhaus" are in the decorative fabrics division. Both are former independent textile houses with high quality and service standards.